After a week of being well and truly back in the swing of work life I could seriously go for another trip away right about now. But seeing as how that ain't happening anytime soon, I've taken to day-dreaming about the amazing time I had over the Easter holiday, when I stayed in an amazing caravan (full details here) at Presthaven in North Wales. Now I'm not going to pretend that the weather was amazingly warm, sunny and glorious or say that we spent hours every day having picnics on the beach or BBQs by the caravan. But do you know what, we had a blooming brilliant time and we didn't even set foot off of the caravan site for the entire trip. There was really no need to because there was just so many things to do. When we first arrived and had unpacked, whilst the boys were making dens under their beds, I spent a little time (with a much needed cuppa of course) looking through our little "what's on" booklet and found that every day there were loads of activities on offer for the boys to take part in. There were things such as football clubs, archery lesson, different pool based activities, arts and crafts - so, so much to keep them happy and entertained. But of course, with me being the total unorganised so-and-so that I am, many of the things I wanted to book were already all full up. I've since realised that booking on-line before you actually arrive is the best way to ensure you get the kiddies on everything they want, and without having to endure the long (often very long) "booking station" queues and I'll certainly make sure I do this next time. 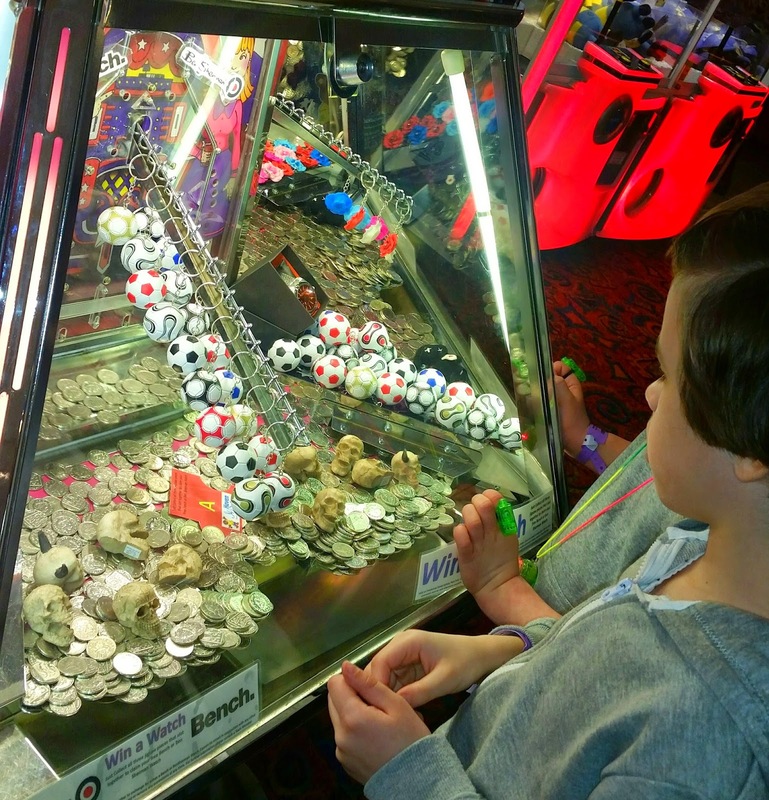 Many of the bookable activities also have an added extra charge to them, which is often not very much but, especially with bad weather, having a £4 half hour Roller Disco session could prove to be money very well spent to help break up a monotonous, rainy day for a kiddie. ...but we still found plenty of things to do on the site, and all of which were included in the price of the holiday. I was no way brave enough to even dip a toe into the water, but the kids were all straight in, squealing with laughter as they were pulled around the circular pool by the current of the water whilst being squirted from the jets of the fountains. It was beyond freezing - but they had a ball. And to be honest I can imagine it being really quite pleasant during the height of the summer months, but at this time of year...no...I'm far too chicken for that. So what else did we get up to...? Hmmm well, we did have our amazing caravan to enjoy and take advantage of didn't we, and that's exactly what we did on the more wet and wild weathered afternoons. Well, when you have the facilities, you have to test them all out don't you - even the TV. But when we woke up on our last full day at the resort to no rain - still plenty of wind - but the wet stuff seemed to be holding off a little, relaxation was the last thing on our minds. It really was pretty and peaceful - I think we could have spent most of the day exploring. ...we then usually headed back to the caravan to climb into our PJs, enjoy a few cartoons whilst we ate crumpets with jam and drank cups of tea before scrambling into bed. However, if we were more night-owl than we were, we could have stayed in the club longer, as the comedians/singers etc all came out to entertain the masses once the kiddies shows were over. But it was bed time for us. Whether you want to spend any extra pennies or not I found that there are so many great, fun things to do on a Haven holiday without ever having to leave the resort, no matter the weather.